I mostly want to focus on the practical / mechanical perspective of this question. I have thought already many times on buying a small electric motorcycle for daily commute etc but i wouldn't min to have small excursion/trip on it (even on these reduced speeds). What blocks me though is that it has such a limited range and such a big time of recharging that even i decided to take the (heavy and bulky) charger along with me and even i could find a power supply available anywhere, i would need to spend at least 2 hours of charging for every 100km of riding, reducing my average speed from 50km/h(an average small electric motorcycle speed) to a silly 25km/h. So... if all vehicles manufacturers and batteries manufacturers had a standardized type of batteries (or a few if for some reason voltage cannot be the same in cars and motorcycles) that would fit all vehicles (or at least all vehicles of a given type) and would be modular in a way that a larger car would fit e.g 8 cells and a smaller car 5 cells and a motorcycle 3 cells etc, then if these cells would be produced in massive numbers (rendering them cheaper than normal vehicle batteries) could it be that they would be available in every gas station and/or remotely "desert" charging (via solar cells) stations so that it would be easy for a vehicle to pay and interchange it's empty battery with a full one without having to wait for long period? These solar cells could be sold separately from the vehicle and thus piping the cost to the final consumer also when going to the charge station you could have your "empty" batteries overall state (age and capacity) examined and upon switching with the "charged" ones a small variance in price could be applied etc. I can clearly see the financial and political implications of such a model but do you find this case to only belong in Worldbuilding??? One of the biggest problems to solve in electric vehicles at the moment is battery - if the battery can be made more efficient, lighter the cumulative increases in efficiency makes the vehicle much more desirable to customers. Once the improvements to be made here begin to peter off I'm sure you'll see a greater push towards standardised batteries - as you say, there is no other direction if we're to replace internal combustion cars - but I don't expect this is something we'll see in the near future. I'm not entirely sure that this question fits the primary purpose of this group BUT I have to say that I've long wondered why electric car manufacturers don't standardise on a battery format and devise some sort of unattended method of battery replacement. I thought something that you drive the car onto and then the battery pack is ejected from underneath and a new one slotted in from underneath could work. From an engineering perspective, I guess the only risk is that when the battery is removed from the vehicle, the vehicle would be immobile until the new battery was fitted. You could then re-engineer existing fuel stations to be equipped with some sort of charging rack in which incoming batteries would be installed and fully charged ones would be taken from. I guess the biggest issue is that EV manufacturers have already established that they're going in another direction with the idea that batteries remain in the vehicle and are charged. Given that the format of the pins on the charging points vary wildly, the chances of getting manufacturers to standardise on a battery format are slim. I guess the thing stopping this is market forces, not engineering challenges. I guess that the only way that would change would be legislative changes from either one major or a small group of governments. This idea is old, like OLD (1890s), but so far nobody has been able to set it up in a financially viable way. The steam car, the internal combustion engine automobile, and the electric car emerged as the main competing technologies in the late 1890s until the 1920s. The concept of exchangeable battery service was first proposed as early as 1896 in order to overcome the limited operating range of electric cars and trucks. The concept was first put into practice by Hartford Electric Light Company through the GeVeCo battery service and was initially available for electric trucks. The vehicle owner purchased the vehicle from General Vehicle Company (GeVeCo, a subsidiary of the General Electric Company) without a battery and the electricity was purchased from Hartford Electric through an exchangeable battery. The owner paid a variable per-mile charge and a monthly service fee to cover maintenance and storage of the truck. Both vehicles and batteries were modified to facilitate a fast battery exchange. The service was provided between 1910 and 1924 and during that period vehicles using it covered more than 6 million miles. Beginning in 1917 a similar service was operated in Chicago for owners of Milburn Light Electric cars who also could buy the vehicle without the batteries. Better Place was a venture-backed international company that developed and sold battery-charging and battery-switching services for electric cars. It was formally based in Palo Alto, California, but the bulk of its planning and operations were steered from Israel, where both its founder Shai Agassi and its chief investors resided. [...] The company's financial difficulties were caused by mismanagement, wasteful efforts to establish toeholds and run pilots in too many countries, the high investment required to develop the charging and swapping infrastructure, and a market penetration far lower than originally predicted by Shai Agassi. [...] The QuickDrop battery switch system would enable Renault Fluence Z.E. 's battery, the only vehicle deployed in the Better Place network, to be swapped in approximately three minutes at dedicated battery exchange stations. Gogoro is everywhere in Taipei and now several other cities in Taiwan. full disclosure; I'm not affiliated in any way and don't own one. 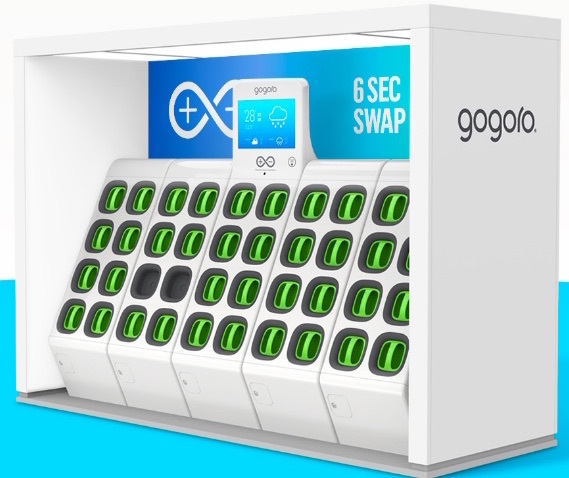 Taiwan currently has over 1,000 swap locations, you pick a nearby site on your phone, "reserve" a pair of batteries and go there and swap them in a few seconds. One possible solution is a flow battery. Electrolyte could be replaced in very much the same way as we refill a car. It's still a viable solution. The engineering to keep the acid in and the rest of the world out is non-trivial though, so we'd need a really good reason to do it. This is currently in use in Taiwan for scooters. Yamaha and Gogoro have both proven to be powerful forces in the light electric vehicle industry. Gogoro has a line of highly successful scooters based on their battery-swapping technology, and Yamaha just rolled their four latest electric bicycle models into shops in the US. I don't see the way to easily swap it to charged one on the battery gas station. It is possible to place different kind of batteries in, for example, trunk, but low placement of battery pack has additional benefit of lowering the mass center. It is widely accepted that the best electric cars today are Tesla. While somebody could argue their frameless door windows, big external size, big wheels with practically no tire left, etc. are just for show and not for go, the technology in Teslas exceeds that of the technology in other electric cars. So, let's take a look how Tesla uses batteries. The batteries in Tesla are cylindrical cells, 18650 or 2170. 18650 has approximately 3 Ah of capacity, whereas 2170 has approximately 6 Ah. It watt-hours it's 10.8 or 21.6 watt hours, or in kilojoules it's 38.9 kJ or 77.8 kJ. A liter of gasoline is 36 MJ, so these figures correspond to about 1 or 2 milliliters of gasoline. So, if you are going to change these batteries, you will be changing energy 1 or 2 milliliters at a time. See the problem? Ok, somebody could claim that best gasoline vehicles (=hybrid) are only 33% efficient, so in reality you will be changing energy 3 or 6 milliliters gasoline equivalent at a time. These batteries in Tesla are hidden under the floor of the car, giving low center of gravity (thus safe and good handling), good behaviour in a car crash, huge electric range, a front trunk (frunk) where you can store stuff, etc. Although in theory the cells can be changed, in practice you don't do it. The Tesla cells typically last for the life of the vehicle, because you are using only tiny fraction of the cell capacities in typical driving. Now, could you make the cells into larger multi-cell units? Yep, perhaps you could. In fact, Toyota has made the NiMH battery into a single unit. The trouble is that the tiny 1.6 kWh unit in RAV4 hybrid weighs about 70 kilograms and in this particular Toyota it takes some trunk space in the rear because it's not under the floor of the vehicle. Also, the units would differ in ideal dimensions between cars (and between different locations in the same car) to make use of the available space most efficient, making standardization difficult. 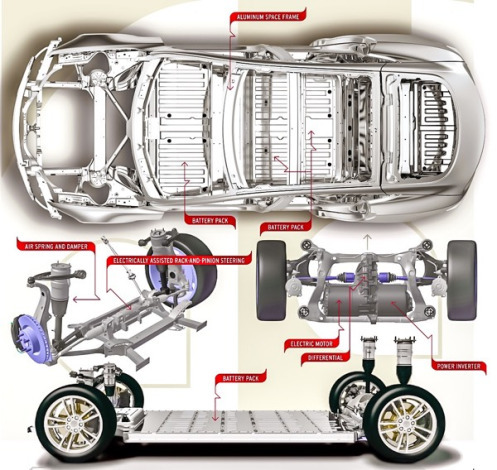 Additionally, you need to lift the car up to change the cells in Tesla under the floor of the car. Changeable batteries thus are not going to happen. The situation is similar to mobile phones. Making the battery difficult to change allows thin phones, which customers prefer. Making the cells difficult to change in a car allows low center of gravity even in a SUV, good and safe handling, crash safety, lots of storage space, long range, etc., which customers prefer, again. In some manner, the cells actually are standardized in Tesla. They are very similar in size to common laptop cells, just use a slightly different chemistry that has been optimized for automotive use and for low cost. But, this standardized size means a single Tesla has a huge number of cells in difficult to access places. Battery cost will go down and size will go up. A secondary market will form for cells that have lost half or so of their capacity, and are thus not ideal for automotive use, but can be used to store wind and solar power in an electric grid for the rest of their useful life. Thus, the battery replacement will be cheaper than it is now, because you get a refund for partially useful cells. There is a reliability problem with this idea that might not be obvious. To give a real-world analogy, four-engine planes have more engine problems per flying hour that two-engine planes, simply because there are twice as many engines for the faults to occur in. If you split the "car battery" into multiple replaceable units, you multiply the reliability problems caused by bad connectors and bad individual units. If a problem like that leaves the car stranded somewhere, who pays to sort the problem out? The charging station doesn't "own" the batteries it charges and swaps, and neither does the car owner. So who picks up the cost arising from the faulty battery? One good feature of conventional fuels is that they are a very standardized product - you can buy gas anywhere without even considering whether there going to be a problem with the fuel you just bought. You would need to make swappable batteries as reliable as that, which might be a hard engineering problem. Of course gas stations do sometimes screw up and have pumps dispensing the wrong fuel, but this is so rare and the consequences happen so quickly that it's clear where the blame lies. Tesla at a point did feature a way to swap the entire empty battery assembly for a fully loaded one. The showcased process required only a prepared station the car would roll over and about 90 seconds later it could roll off with a full battery. But then the abundance of free and fast superchargers offered a more compelling alternative and the project never really moved out of the pilot phase. Especially when considering that the ACTUAL process instead of 90 seconds took about seven minutes, was partially automated but partially still manual work (that can go wrong), required a pre-negotiated appointment and the car owner had to pay for it. On top of that, the vehicle did not recognize the new battery as such and continued to count the distance achieved with a supposedly single charge. Owners also were worried about the possibility of giving away their brand new but empty batteries for an old and worn out, albeit full one and thereby losing on maximum charge capacity, and thus vehicle price. "People don’t care about pack swap. The superchargers are fast enough. Based on what we’re seeing here, it’s unlikely to be something that’s worth expanding in the future unless something changes." Not the answer you're looking for? Browse other questions tagged battery electric-vehicle or ask your own question. What is more cost effective: re-charging a car battery or replacing it new when it dies? Can an 18V-5W Solar Panel Provide an Equalizing Charge for a Battery?